The E1.2B3F1 is a compact tank that offers enough juice to lift a 4,536-kg. truck or SUV. 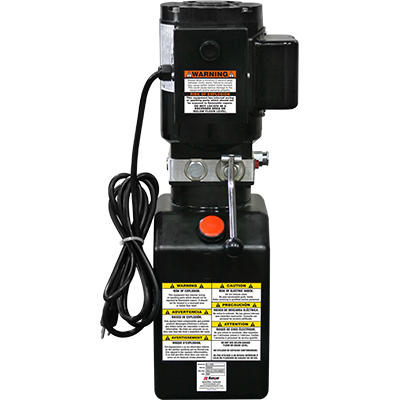 This hydraulic power pack is designed with a generous 2500 PRV, which means the unit can handle higher back-pressure that exceeds normal operating conditions. Don’t let the lighter tank fool you into thinking this hydraulic power unit is weak. In fact, many of our customers prefer smaller tank sizes for one simple reason: they get the job done safely and efficiently. Why get more than you need? The 1.5 HP motor is powerful enough to handle lifting applications on all of our low-rise lifts, as well as some of our full-sized lifts. Plus, the single-phase, 50/60 Hz design is super-efficient; when used on a low-rise car lift, your car will be lifted to the lift’s max capacity in just 30 seconds. The crowning achievement of the E1.2B3F1’s design is the fixed-volume hydraulic circuit with an optimised pressure-sensitive relief valve. When the system pressure exceeds 2,500 PSI, the valve opens and allows fluid to bypass rapidly and safely. The valve automatically closes when the pressure levels return to normal. A hydraulic power unit with an optimised relief valve is essential for shops that need to operate heavy loads worry-free. When the “down” button is pressed, the mounted power unit requires less electricity compared to its ascent. This is accomplished by the hydraulic power unit’s careful engineering, which accounts for the pull of gravity on the lift. Additionally, the entire case of the unit is sealed, protecting the motor from weather, oil, dust, debris, etc. To top it all off, this power unit works in a temperature range of (-25 – 79°​C). No need to worry if it’s too hot or cold to operate the unit. This hydraulic power pack is totally CE Approved, which is the certificate you need if you don’t want to see sparks and smoke when it’s not the Fourth of July. If you’re looking for exceptional power on a low-rise car lift and want the versatility to fit this unit on a range of other BendPak lifts, be sure to ask us about the E12B3F1 hydraulic power unit.